We won't be beaten on price. If you find a better price for the same products please give us a call. At Cubbies & Sheds Galore we have a large range of Gazebos, Rotundas and African Huts to enhance your outdoor experience. Many have a range of options so you can design your own unique outdoor structure. Whether you need to transform your outdoor recreational area at Home, School, Aged Care facility or Hospital, residents and visitors will enjoy these Gazebos for shelter, BBQ luncheons or as a stylish garden pavilion. 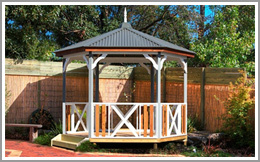 Paint or stain your own Gazebo to your own unique colour scheme. All of our Gazebo range can purchased in kit form or be fully installed. We can also arrange Permit applications and concrete slabs. 3.15 x 2.75 x 2.9 high with 'Manor Red' colorbond roof. Showing optional cypress pine deck and vertical pickets. 4.25 x 3.15 x 2.9 high with Cottage Green colorbond roof. 5.75 x 3.15 x 2.9 high with 'Deep Ocean' colorbond roof. Showing optional bench seats & cypress pine deck. This beautiful Gazebo will create an attractive and functional entertaining area - in your own backyard! Dark Tinted corrugated polycarbonate roofing for filtered light. with step by step instructions, Engineer approved design.